A short video currently went viral where an unfortunate young boy tripped and punched a tear in an Italian baroque painting supposedly by the painter Paolo Porpora (1617-1673) and later said to be from the hand of Mario Nuzzi (1603-1673). The fist size hole was “fixed” afterwards in an 18 hour conservation effort. Still, the question remains how heavy the painting was actually damaged, what was its impact and significance and how it may change the future perception of the artwork. In general, a damage of an artwork can be of a material and/or immaterial nature. In the most cases, besides the loss of authenticity which sometimes leads to a total loss of value, both aspects need to be considered by significance and impact. The nature of the damage (physical or chemical), the size of the damage in relation to the overall size of the object, the conservability of the damage and its impact on aging, the condition before the damage, the stability, the change in technical and applied functionality and usability and the effect on the perception of the technical mastership of the artist/craftsman. The location of the damage in the composition, its visibility and impact on the aesthetic perception, the applied or historical function of the object, the impact on the authenticity, the perception of the artistic mastership of the artist, as well as on the oeuvre or ensemble including a change in the public and scientific perception. The materials used for the painting seem to be the traditional ones one can expect from a 17th century painting from Italy. The canvas, made of flax fibres spun to yarn and woven most likely in twill weave, giving the surface the characteristic diagonal relief which is visible due to a thin paint layer and probably too much pressure during an earlier conservation process. The reverse of the canvas is of dark colour hinting to an advanced oxidation and even additional consolidation media soaked from the front or from a former lining, for the painting appears incredibly flat. The oxidation of the canvas leads to a lack of elasticity and brittleness. This explains why the punch caused almost no deformation but a very sharp tear of the threads of the canvas. The ground layer, the gesso, traditionally was made from mineral fillers like chalk, gypsum, sometimes pigments and a binder like animal glue, maybe with a little oil added. It was the ground for drawings, underpaintings, isolation layers and finally the paint layer itself. The paint layer was made from a drying oil, most likely linseed, nut- or poppy-seed oil as binding media, probably as mixed media with resins and maybe partly egg yolk, with pigments and dyes as colouring agents. In the drying process of oil- based systems, again it is an oxidation process leading to a first curing (after the evaporation of solvents), followed by a crosslinking, the polymerisation, resulting in a brittleness of the layer as well, best seen in the form of the so called age craquelures. The varnish, usually made from natural or synthetic resin and almost never the original one, normally doesn’t influence the stability of a paint layer. It is the brittleness of the paint layer that explains the very little loss of substance in the ripped area. The paint fragments remained in their location. Furthermore, it can be assumed, that the painting had undergone several conservations and restorations since it has been created and was in stable and consolidated condition before being lent to the exhibition. The condition in 2012 is documented online on the site of the auction house Della Rocca where the painting was displayed as a work of Mario Nuzzi. But let’s get back to the impact and significance of the damage for the “destroyed painting” (as some in the German press have stated). The material damage here clearly is of a physical and not of a chemical nature which is positive. The matter just changed its form and location but not its composition. The painting is large and, in relation to the overall size of 140×210 cm, the size of the tear is quite small even when a slight deformed area is included. In modern conservation a canvas tear can be successfully restored with minimal invasive methods. The ends of the ripped threads are “soldered” together with a thermoplastic glue so that the woven structure is reformed. Patches, as used in earlier days, cause additional tension and disturb the vapour diffusion of the canvas. The task today is, to reattribute the tension of every single thread with the minimum amount of glue. Little losses along the tear can be filled with gesso and retouched with matching colours. The damage will no longer be visible, but may appear later on due to the different aging processes of the restored area. It is not known how the general condition of the painting was before the last conservation but it can be assumed, that some restoration works had been done in the past making the damage to be one among several. 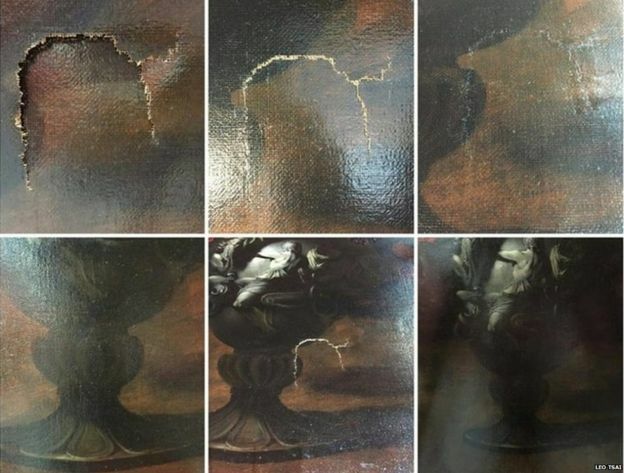 Significant is, that the photo of the Della Rocca auction in 2012 show losses or retouchings of the paint layer almost exactly, where the recent damage happened so lesser original substance may be affected. Still, the stability of the painting is weakened, even after conservation. If there ever will be stability problems, they will start there. The technical function as mountable artwork is not disturbed and the usability will only slightly differ for how one needs to handle a weakened artwork. The perception of the artist’s technical mastership is not impaired. Regarding the immaterial aspects of the damage, we have to look at the location in the composition first. 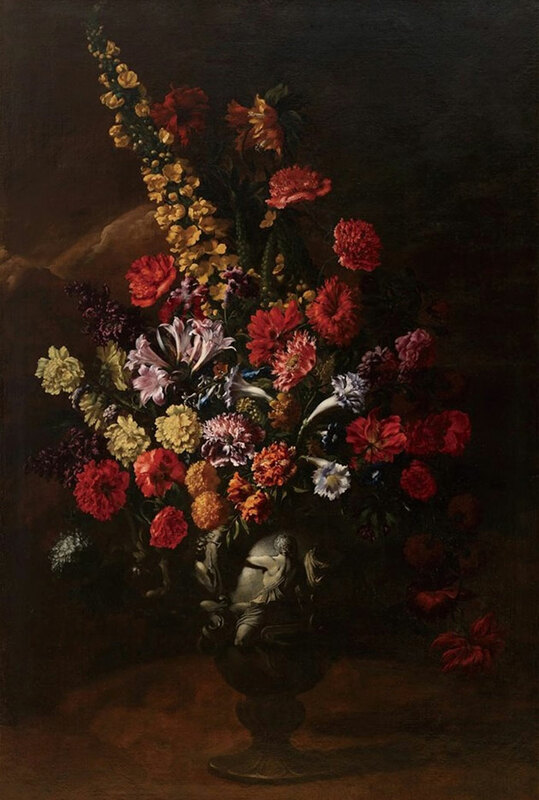 The tear seems to be in the lower right corner in the diffuse background slightly touching the vase of the flowers. No relevant artistic areas are affected. Retouching and little warping in dark backgrounds are not obviously visible (if the gloss level fits) as, for example, in a bright sky, so that the visitor’s eye will not be distracted from the main concept of the work. What the current applied function of the painting is, can’t be determined without further research. If seen as an example for Leonardo da Vinci’s impact on art, it still fulfils the task of the exhibition. If considered only as an investment, the damage may have a dramatic impact on its later return. The “immaterial damage aspect” of the affected authenticity was actually introduced for cases when signatures were damaged or characteristic elements in the composition were destroyed. The current forgery or misattribution claims that came up because of the incident may cause a much heavier damage on a secondary level and, if not true, may lead to a permanent insecurity of the authorship and, if true, to an instant loss in value. The perception of the artistic mastership, whomever it may have painted, is not influenced by the damage. if the signature even exists on this one, for the quoted source may refer to another “Flowers” in a different private collection. With 3), the damage affects the small oeuvre of Paolo Porpora as well, for it gives the work an outstanding significance and with 4) it still does but with lesser impact. With 1) and 2), the damage may be of importance for Nuzzi’s larger oeuvre. The unfortunate circumstance that lead to the damage and the way it virally spread through the media will forever mark it as the “painting the little boy fell in”. It will keep any potential buyer “savant”, aware of the damage. As the perception on the market changed, the public and scientific may too, either by generating a higher level of interest in and popularity for both artists, or, on the secondary level, by leading to the attribution, reattribution or, as forgery, to the evidence room and to court. 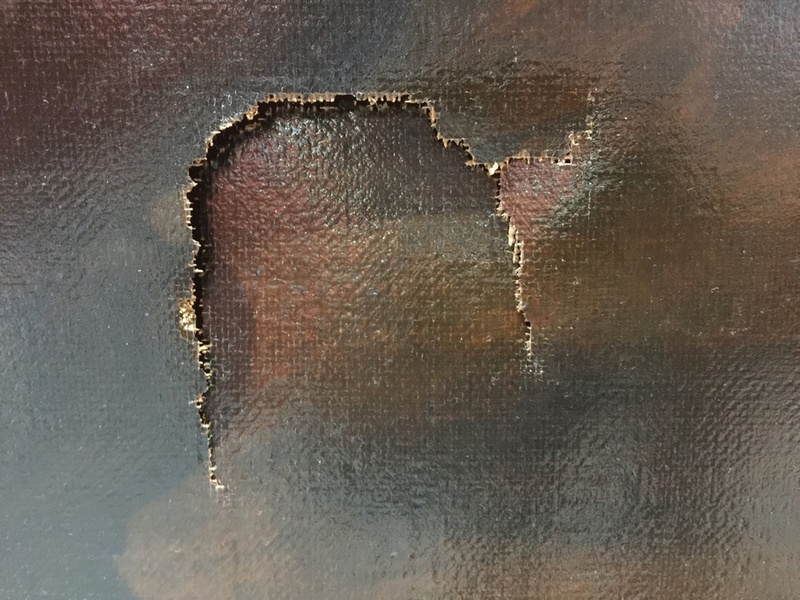 In a conclusion to the significance and impact, the material damage is quite small, can be perfectly restored but may lead to a permanent weak spot in the painting and will require a more careful handling. Putting a heavier weighting to the immaterial aspects, an allegedly singular signed work of an artist has an outstanding role in the oeuvre, making the damage more significant for one and for all. In the end, it will be the change in the perception, that will provide the strongest and long- lasting impact and reverberation, heavier than the damage itself and the restored area could ever do. The loss of value after conservation is yet to be discussed on this basis. So, don’t worry, young man, technically it definitely could have been way worse. Just imagine the painting had been a pastel or a monochrome work and the can still filled with coke or hard liquor for the stressed teacher. And if the further investigations, that were accidently started, lead to a higher popularity of Porpora and Nuzzi, resulting in an attribution, reattribution or even in uncovering a forgery, the damage might even turn out quite beneficial. Cheer up! Pic. 1: The painting of Paolo Porpora/Mario Nuzzi in “12 year boy trips and punches hole in 1,5 million painting from 17th century, www.boredpanda.com. Pic. 3: Closeup of the tear in the canvas, Leo Tsai in “12 year boy trips and punches hole in 1,5 million painting from 17th century, www.boredpanda.com.